A new purpose built Data Centre for the University of Ulster at their Coleraine campus. On this technically challenging project, we deployed the skills and expertise demanded to successfully complete this contract in the tight programme required by the client. The new facility included a new 800KVA 11KV transformer in a new Dedicated Substation, two 550KVA standby generators and 4no. 100KVA UPS units, offing the best possibly redundancy system for the IT equipment. Having multiple Mains and Generator fail scenarios controlled via bespoke PLC software and paralleled UPS systems, Mains Power was served via 12No. different Form 4 switchboards through almost a Kilometre of 4c300 SWA, ultimately ending up with dual supplies at each cabinet position. Within the Data Hall, which is capable of up to 88No. 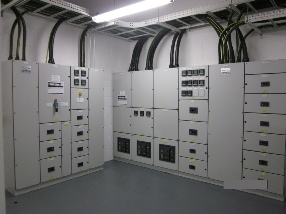 800x1200 comms cabinets, we worked closely with Rittal of Germany to design a Hot Aisle Containment system incorporating closed cabinet pods with bespoke chimney systems. A truly unique project once again showing Braham Electrical have the in-house technical ability to deliver some of the most advanced projects on time and to the clients full satisfaction.